Instituto Cervantes Director-Dr. Jose Rodriguez (center) poses with WMSU Prexy-Dr. Grace Rebollos (leftmost) and Dr. Emmylou Yanga during the conferment rites. 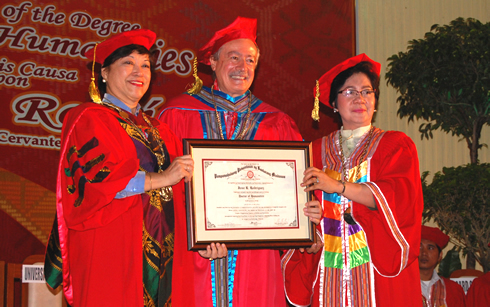 Western Mindanao State University conferred the degree of Doctor of Humanities, honoris causa, upon Sr. José R. Rodriguez, Director of Instituto Cervantes, last July 25, during the 107th Foundation Day celebration of the university at Dr. Juanito Bruno Gymnasium in this city. Jose R. Rodriguez is the current Director of Instituto Cervantes in Manila which is tasked to promote and teach the Spanish language and culture worldwide. Rodriguez was born in San Xoán de Río in the Northwestern Autonomous Region of Galicia, Spain in 1950. He spent his childhood and his youth in the province of Ourense. He is married to known Filipino portrait, Lourdes Conching and has two children: Lara Maria and Jose Francisco. He finished his Agricultural Technical Engineering degree by the Polytechnic University of Madrid in Madrid, Spain. He holds a Ph.D. and M.A. in Business Administration which he earned at Newport University in California, USA. He was also conferred Degree of Humanities honoris causa by the Pamantansan ng Lungsod ng Maynila (University of Manila) and the St. Mary’s University (Bayombong, Nueva Vizcaya). After a brief military service in the Sahara desert, he became a journalist and a correspondent for major Spanish dailies. Aside from his writings, he is also vigorous in strengthening Spanish-Philippine relations. Together with Raul Manglapus and other Philippine hispanist, he co-founded the weekly “Cronica de Manila,” a Philippine publication in Spain. Jose Rodriguez also founded the Centro Gallego de Filipinas, an association of Galicians in Asia for the purpose of promoting relations between the region of Galicia and Philippines. For his efforts in strengthening Spanish-Philippines relations, he received the following awards and decorations: Encomienda de Isabel la Católica (Royal Award, Spain), the “Order of Sikatuna (Republic of the Philippines), Medal of Galicia (Autonomous Region of Northwestern Spain) and Tourism Award (Galicia, Spain). He is a writer and journalist by profession. He holds the posts of the Regional Bureau Chief for Asia-Pacific and the Adviser to the President of the Agencia EFE (Spain’s International News Agency). Rodriguez also the Mass Media International Foundation and is the president of the Foreign Correspondents Association of the Philippines (FOCAP). He is a contributor to several local and foreign publications. He is the current Director of Instituto Cervantes de Manila at the same time the Honorary Director of the Academia Filipina de la Lengua Española (Philippine Academy of the Spanish Language, a branch of the Royal Academy of Spain). Rodriguez sits as the Chairman of the Board of the CB&T Phils. Inc., Board Member of the MS-Sigma Dos Philippines, Inc. and Big Brother, Inc. and the President of the Centro Gallego de Filipinas. Rodriguez has published three books: Philippine First Ladies Portraits (Manila, Philippines), Crónicas (Manila, Philippines) and the 12 Poets of Guadalupe (Madrid, Spain). On the other hand, along with the conferment of Sr. Jose R. Rodriguez, the university also recognized the commendable achievement of a female Zamboanga prosecutor and WMSU alumnae, Atty. Darlene R. Pajarito. The latter was remarkable for successfully prosecuting the first human trafficking case in the Philippines and trying the first labor trafficking prosecution resulting in a conviction. Atty. Pajarito’s exemplary performance was recognized by the United States of America and was bestowed with the 2011 United States Global Trafficking in Person’s Hero Award. US Secretary of State Hillary Rodham Clinton herself conferred this prestigious award on Atty. Pajarito, the lone recipient from our country, along with 9 other awardees from all over the world. The citation was held during a luncheon function held at Sapphire Ballroom, Grand Astoria Hotel of this city.